The art of luxury comes to life at The Ritz-Carlton, Millenia Singapore. This multi-award winning hotel welcomes guests with expansive and elegant accommodations, panoramic views and plush amenities. The hotel's exquisite 4,200-piece art collection includes works by Dale Chihuly, Andy Warhol and other icons. Enjoy a multitude of dining options including contemporary Cantonese cuisine at the Michelin-starred Summer Pavilion. Step into a world of serenity at Asia's first La Mer hotel spa. Capturing the essence of the ocean, this spa offers a host of rejuvenating treatments including massages, facials and ESPA body therapies. The immersive Ritz Kids program offers special amenities and engaging activities for young guests, including experiences such as in-room camping. 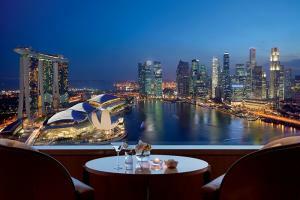 Located in Marina Bay, approximately 12 miles from Singapore's Changi International Airport.